The small village of Konergino, a majority Chukchi settlement. 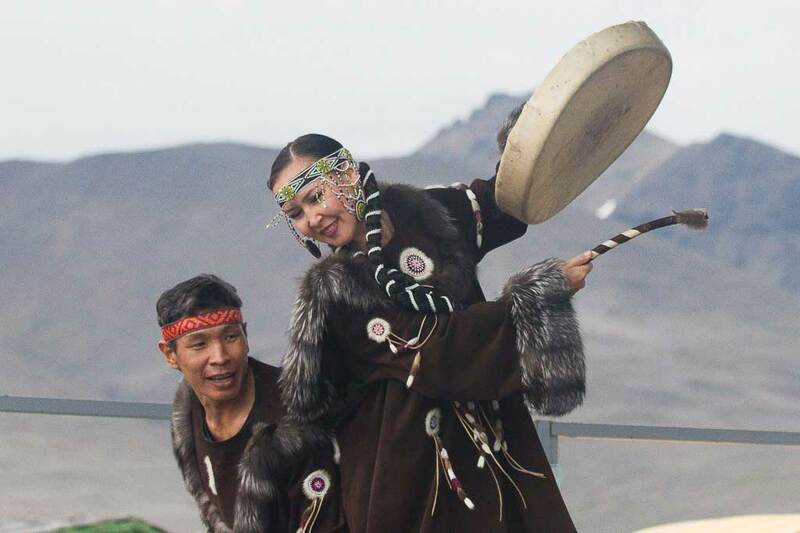 Understanding the practice that has sustained generations of Chukchi. This morning we woke up to a gray fog and a loudspeaker announcement that a few walruses were frolicking not too far away from the shores of the village of Konergino. Still half asleep, I threw on the first warm thing within reach and ran outside with my camera. Indeed, there were some walruses diving and then resurfacing for air. My eyes are not strong enough to see them that far away but, luckily, my camera lens is! Things like this make waking up at 7 a.m. a lot more worthwhile. After breakfast we received our daily briefing on today's program. Unlike yesterday's trip to Egvekinot, where a large part of the population is Russian, today we are visiting the small village of Konergino, a majority Chukchi settlement. This will give us the opportunity to witness the Chukchi people’s indigenous way of life and learn about reindeer herding, which is still an important part of the indigenous people's culture and economy. What makes today all the more interesting and exciting is that we are the first big tourist group that these indigenous people will get to host. Rodney (the founder of Heritage Expeditions) met these people when he and Katya (the Russian speaking scientific crew member) were snowmobiling across the tundra and had to stop in Konergino, a village of just 274 inhabitants, to fix their vehicles. They immediately struck up a friendship with the locals and were invited back. So we are the first big expedition group for Heritage Expedition - or any adventure travel firm for that matter - to have the pleasure of meeting the locals. No pressure! We arrived on the shores of Konergino to a lovely welcome ceremony. Women in traditional Chukchi attire were awaiting us with friendly smiles on their faces and a tray of meat to welcome their guests. But first, each guest had to jump over a tiny bonfire - a Chukchi ritual for those coming back ashore. Yours truly is a vegetarian but fellow expeditioners remarked that the meat was quite delectable. I wasn't sure who was more excited to see whom. Clearly for us this visit was something out of the ordinary, as it was for the locals, too. It isn't every day that a large group of foreign tourists comes to visit. So we were taking photos of them and they were taking photos of us. I guess I'll feature in a couple of Chukchi family albums! To be entirely honest, I was expecting to teleport back a century to a place that has the most basic of technology and is untouched by modernity. But we were led into the local concert hall that was equipped with a laptop, state of the art speakers and a projector screen. All the locals had smartphones, some had pretty fancy cameras and a Wi-Fi network was set up around town, though it didn't seem to be functional today. Yulia Ivanovna, the village librarian. walked us through Konergino's history with a detailed PowerPoint presentation. The name Konergino is derived from the words "curved valley" in the Chukchi language. During the Soviet years a kolkhoz (collective farm) was formed here that specialized in various things throughout the years: reindeer herding, whaling, fishing. The village grew and different facilities (a kindergarten, school, post office, hospital, etc.) were built upon necessity. At present, there are three reindeer herding brigades in operation at Konergino and virtually every family is somehow involved in this activity. The historical part was followed by a cultural presentation of local song and dance. We heard traditional Chukchi throat singing, the children in their colorful costumes performed various dances that were mostly centered around the theme of the animals of the Arctic, a comedic sketch about an old married man who forgets his age and tries to go after younger gals made everyone chuckle and a national Kazakh song illustrated the village's ethnic diversity. At the end, everyone was invited to figuratively exchange their rubber boots for dancing shoes and take part in a little free dance jam with the locals. For the third part of our program, we went outside to see a traditional yaranga (tent) that used to be the herders' dwelling in pre-Soviet times, where the villagers were hard at work preparing a lunch for us. There was, of course, reindeer meat, fish and several salads prepared from local herbs and what appeared to be some sort of seaweed. Konergino is not as colorful as some of the other Chukotkan villages that got a facelift during the Abramovich glory years and on a rainy day like this, this one looks a bit gloomy. But we hardly noticed it thanks to the absolutely incredible hospitality of the Chukchi people. The effort they put into organizing this cultural program for us was phenomenal and they really managed to pull it off to a very high standard! On the way back to the Zodiac I even received a little parting gift from one of the Chukchi. Rodney was so impressed by the hospitality that he invited a few of the locals back to the Spirit of Enderby for a second lunch and presented them with his book about Antarctica. That was definitely enough excitement for today! Apart from a couple of very informative lectures about Chukotka's history and puffins (aww!) in the afternoon, the rest of the day is for downtime and attempts at spotting whales. We are at sea until we hit Preobrazhenya Bay tomorrow morning. Note: after writing the previous paragraph, we got dessert way before dinner. First a pod of Humpback Whales made a plentiful appearance. Soon after, we got a cherry on top of the icing - a pod of Orcas casually jumping out of the water soon after. I think I will sleep well tonight!